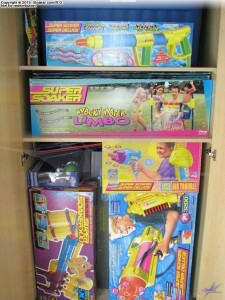 I have often been asked how I store all the water blasters I have accumulated over the years. The answer is: with a lot of effort! After passing a several hundred item mark a few years ago, I found myself with a definite need for being able to store things decently. That said, while my current system is ok, it is far from optimal and someday, time and more free money permitting, I want to better organize my collection. In the meantime, here is a glimpse of what I consider as "deep storage" for me. The furniture unit shown is a Pax Wardrobe purchased from Ikea. For those familiar with this particular piece of furniture, it is nice, boxy, and deep. Behind the Super Soaker CPS3200 box are Monster X and Monster XL boxes. On the top is a fairly large Rubbermaid bin that fits happily within the wardrobe unit that holds a number of smaller, non-boxed water blasters. The entire set-up is kept in a temperature controlled space that is low in humidity (but not desiccating) environment.